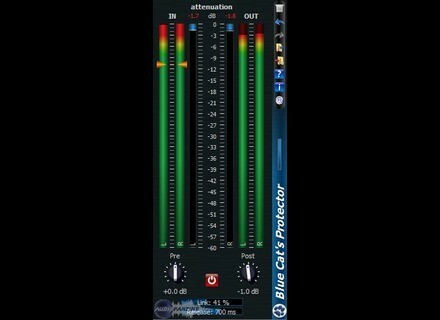 Blue Cat's Protector, Software limiter from Blue Cat Audio. Product replaced by the Blue Cat Audio Blue Cat's Protector 2. Blue Cat Audio has updated its stereo brickwall limiter, Blue Cat's Protector, to v1.1 for Windows and announced its availability for Mac OS X for the first time. The plug-in is now available for Mac OS X in VST and Audio Unit formats and the update includes several improvements and fixes to the Windows VST and DirectX versions, according to Blue Cat. Mac Audio Unit and VST support. New Windows installers (faster install, improved upgrades). Automation output can now be disabled for hosts that do not propose automated parameters choice. (Bug Fix): fixed MIDI learn issues. (Bug Fix): window opacity is now properly reset when selecting factory presets. The plug-in can be purchased alone or within the Blue Cat's Master Pack plug-ins bundle. A demo version is available for download and the product can currently be purchased at a special introductory price of €53.10 (instead of €59) / $71.10 (instead of $79). For more info, check out www.bluecataudio.com. DSK Releases Music Ethereal PadZ 2 DSK Music has released DSK Ethereal PadZ 2, a new free VST instrument plug-in for Windows that is described as an "Advanced Pads Sound Module". Intermorphic Updates Noatikl Intermorphic has updated Noatikl to version 1.5.0.15. Impromptu Updated to v1.34 Impromptu has been updated to v1.34.